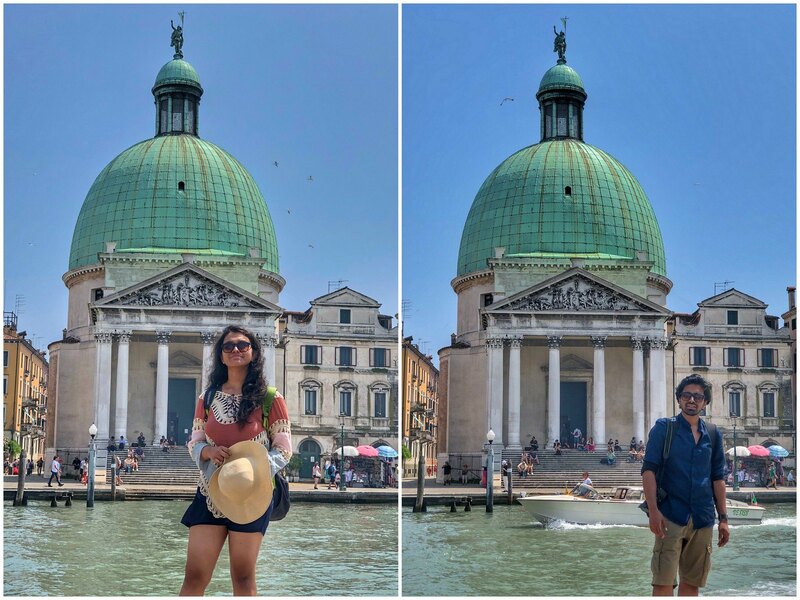 Floating Masterpiece: Thats how Lonely Planet termed Venice. And I can’t agree more after having spent some days here 🇮🇹 with my family. 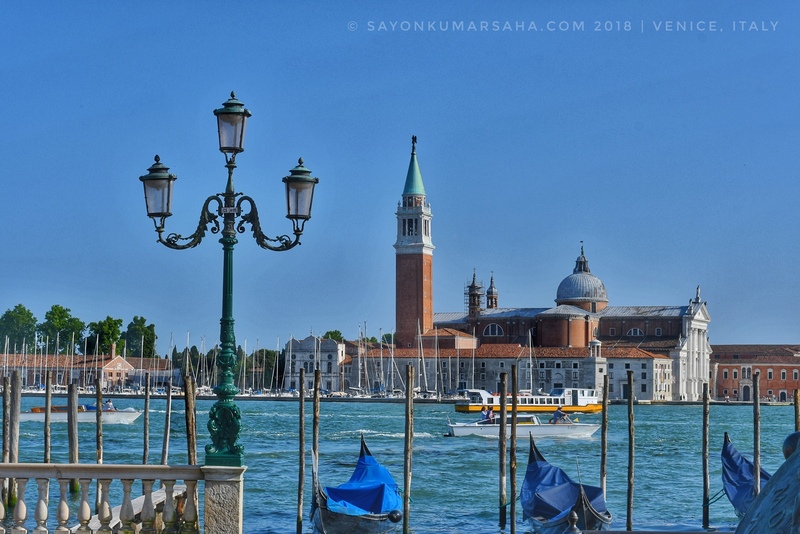 I am not fully aware of the history of Venice unlike Rome or Florence, but I cannot imagine humankind daring to build a city of marble palaces on a bunch of lagoons by the Adriatic sea. It is simply impressive. 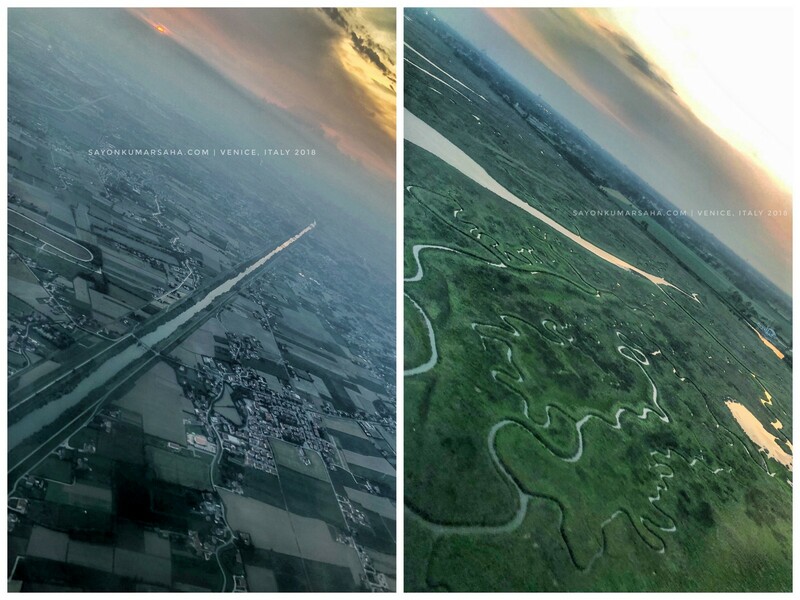 That’s how we knew its touch-down Venezia from the airplane. We were flying from France and thus landed a bit far from the main island. 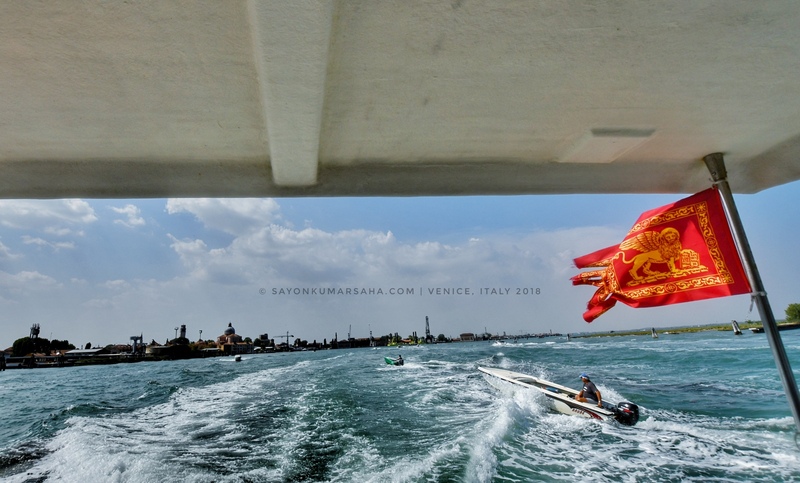 Although Marco Polo airport is a bit away from Venice main island, but very well connected by both by road and water. This was the only time we took a roadway bus instead of a water taxi for the next few days. We had to walk around half-an-from the the bus terminus in the main island. Since we were arriving close to midnight, little did we know the charm of Venice from that walk. 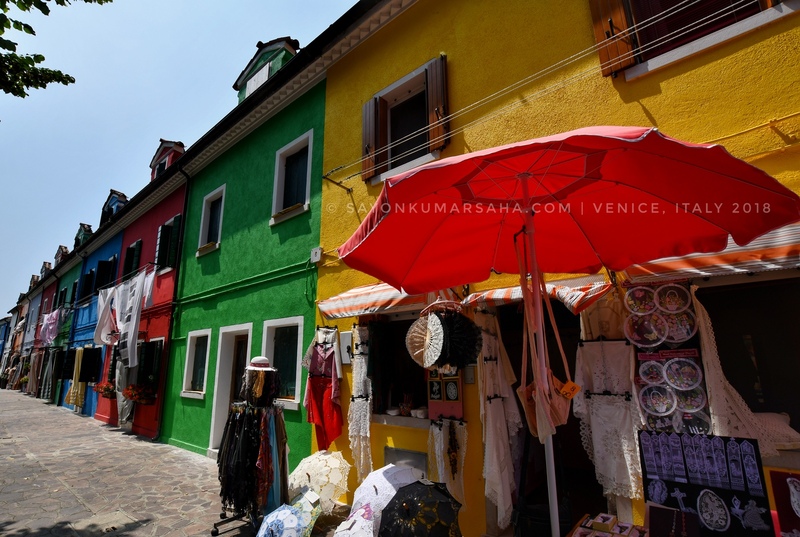 But one thing we realised about Italy instantly is that we would enjoy the “noisy street-side shops” here much like India. The next morning we prepared ourselves for long walk. 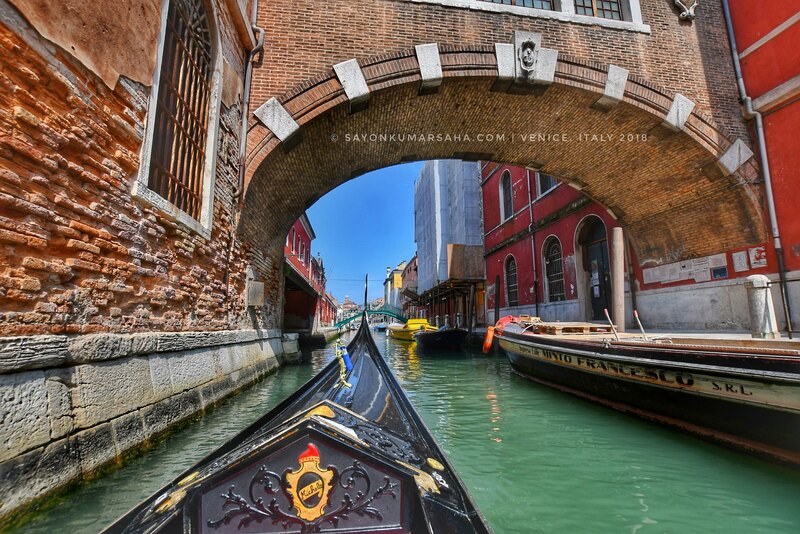 In no time we were across the beautiful canals & bridges across Venezia alleys. 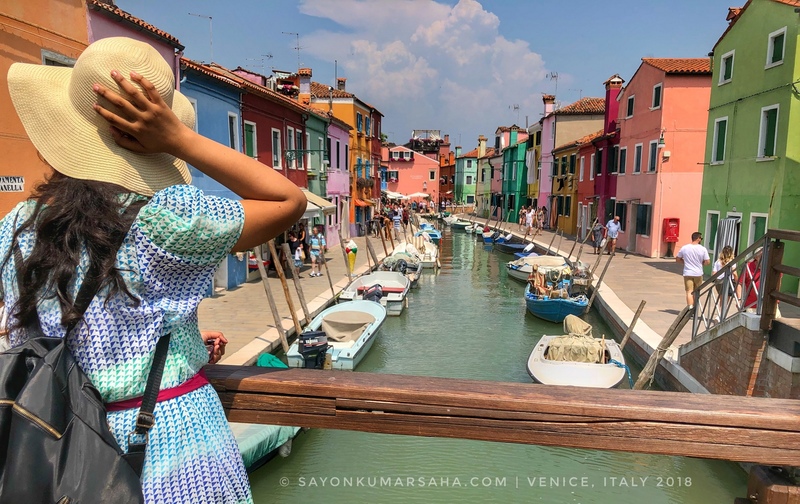 Even being one of the most touristic places on the earth during summer, Venice does not seem to lose its enchanting power. It only adds to the vibrance! And not to mention, the archipelago is a photographers’ paradise. Boats lie all around ready to ferry you across islands. 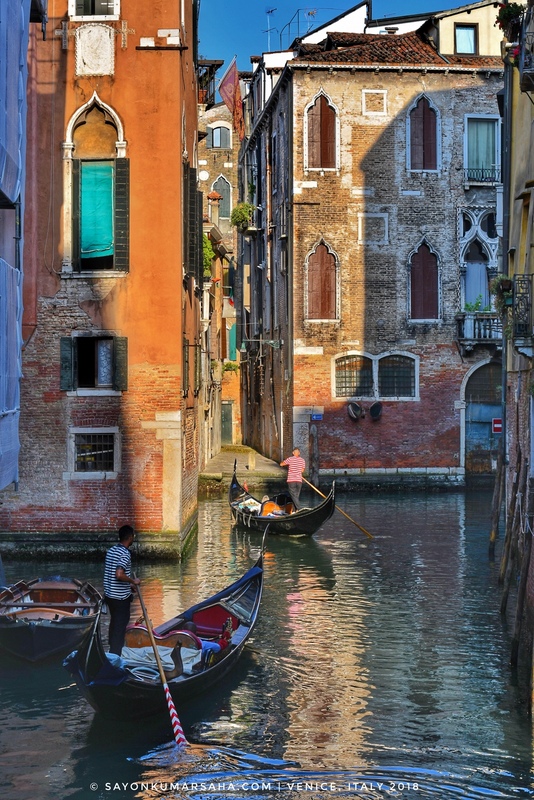 Venice is an archipelago of roughly 120 islands formed by more than 150 canals of shallow lagoon. Reportedly there are 410 bridges connecting them. 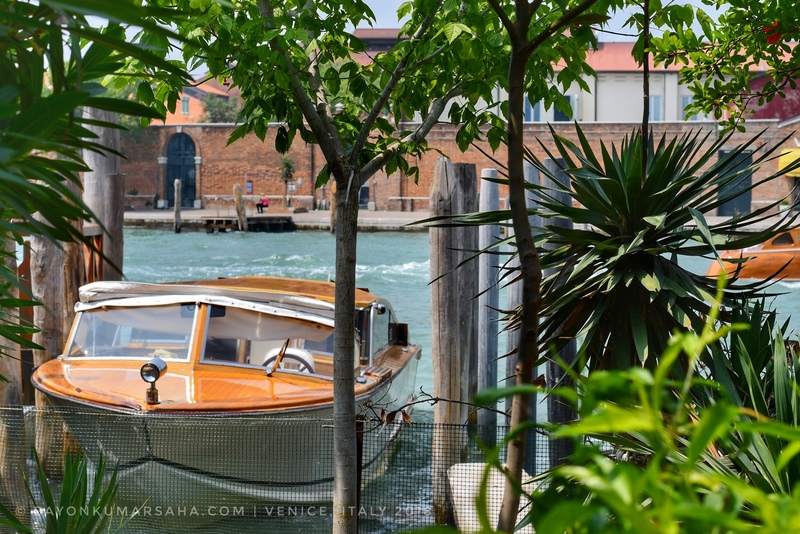 We wouldn’t mind spending time across the canals and absorbing the vintage beauty across them. 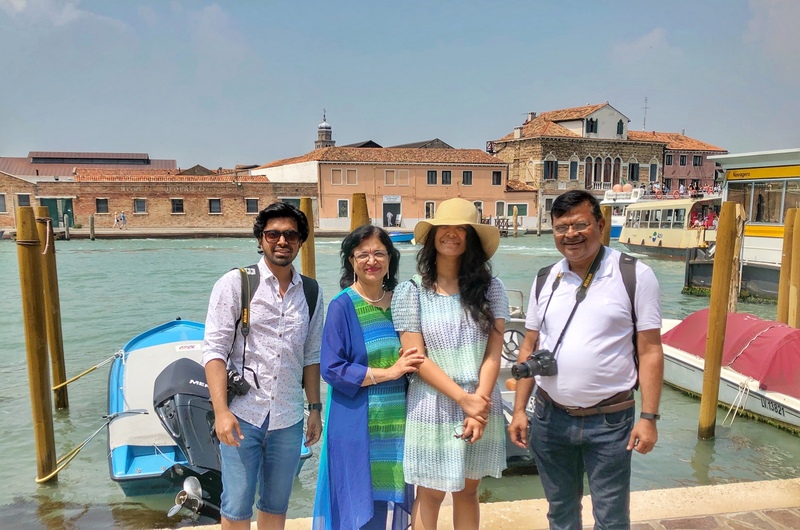 Soon we were at the Alilaguna harbour in front of the Royal Gardens, near St. Mark’s Square, We were ready to take the cruise across the three major islands of Venice: Murano, Burano and Lido! The ferry tickets are available on the spot. But just to be to be safe I had the tickets booked online from GetYourGuide! 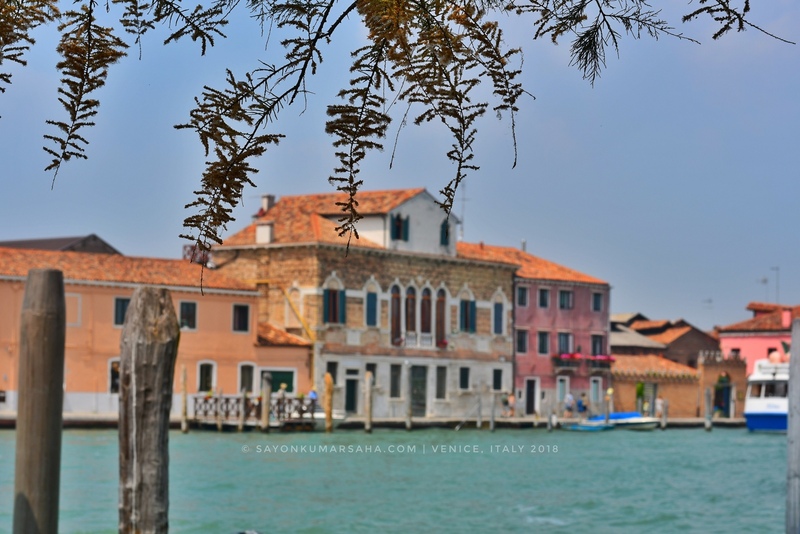 A couple of km away from the main island lies the island of Murano! It was hardly a 20min boat trip. Happy faces at Murano, the island with an unique character. 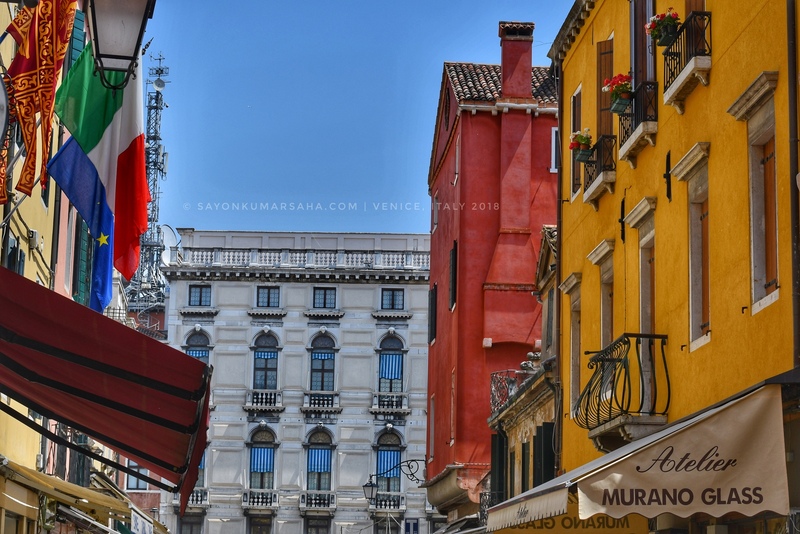 Ever since the medieval and Renaissance period, Murano evolved into the world’s leading centre for glass manufacture. The skill and tradition exists even today that attracts tourists all over the planet. You could walk by the alleys of this island and never stop staring with amazement at the beautiful glass work. 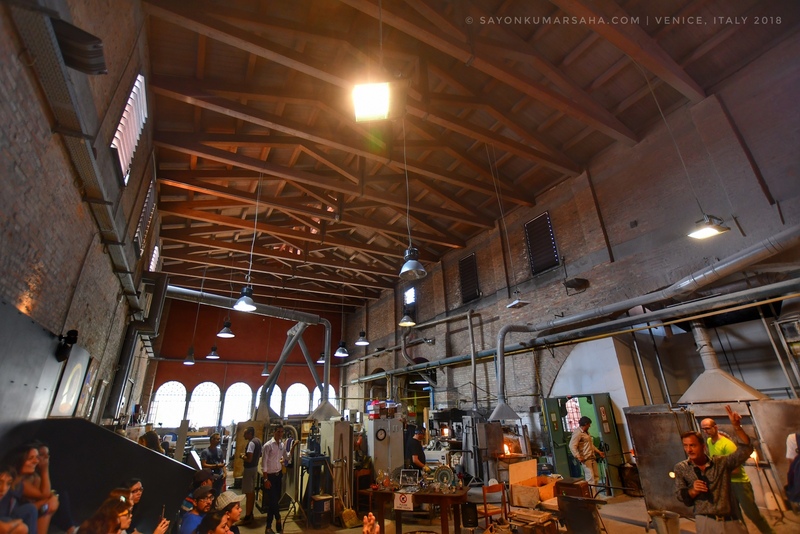 The visit to the glass factory of Murano was one of the most enchanting experience! Most people are accustomed with pottery where potters carve out beautiful pieces from clay. But what if I told you molten glass? The artists effortlessly transformed molten glass in the furnace into a beautiful horse figure within minutes. 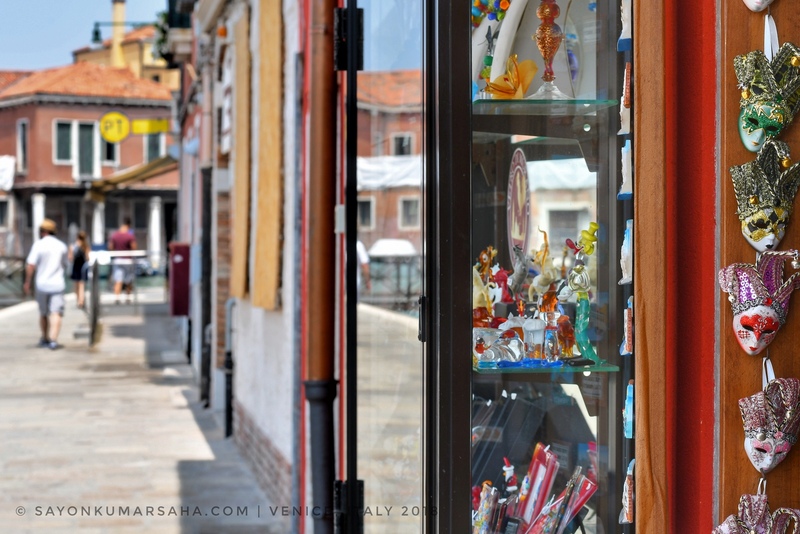 The artisans of Murano of this kind still employ centuries-old techniques like glass blowing to craft everything from contemporary art glass and glass jewellery to Murano glass chandeliers and wine stoppers. 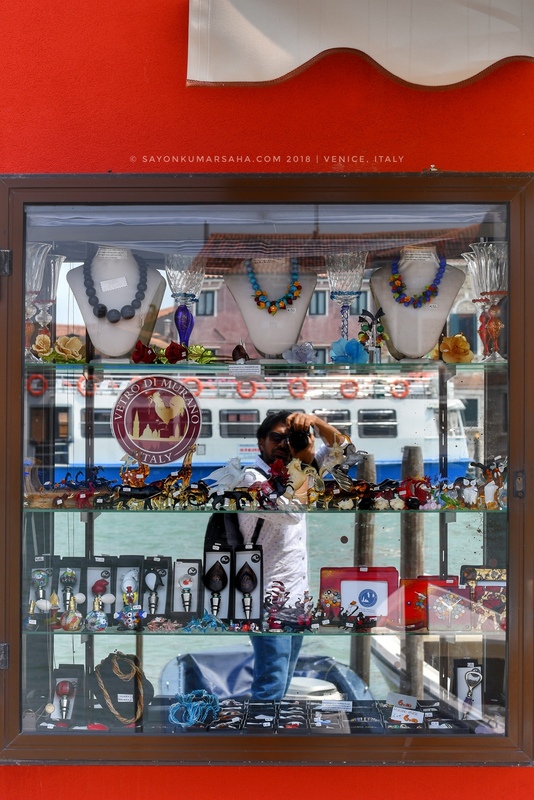 Countless vases, bottles and bowls, ornaments, paperweights and mirrors in Murano’s shops are an evidence of enormous importance of the glass industry to this island. 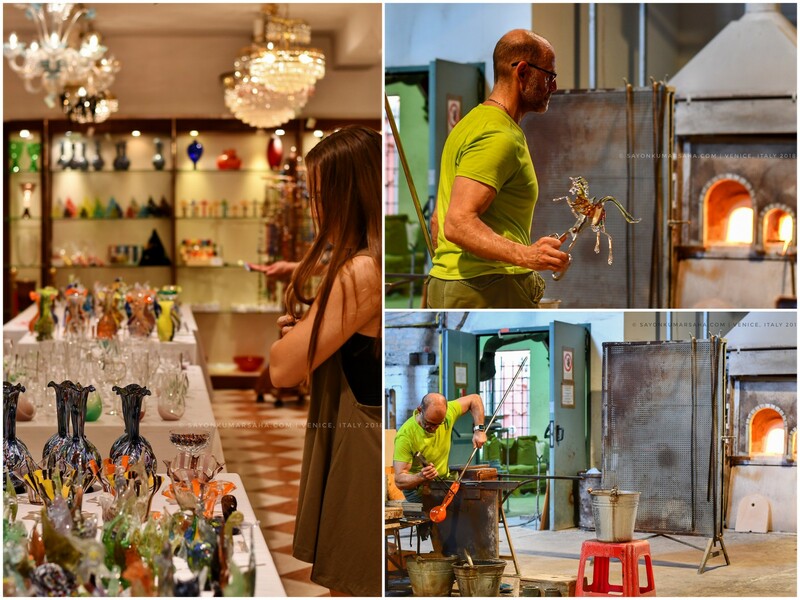 The glass art experience will be etched for a long time. 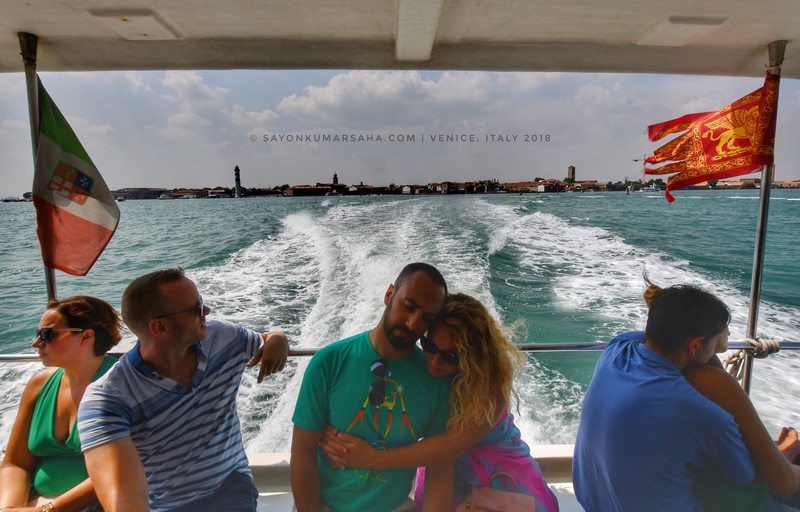 The ferries or cruises between the islands of Venice are well planned and packed with people all through the season! 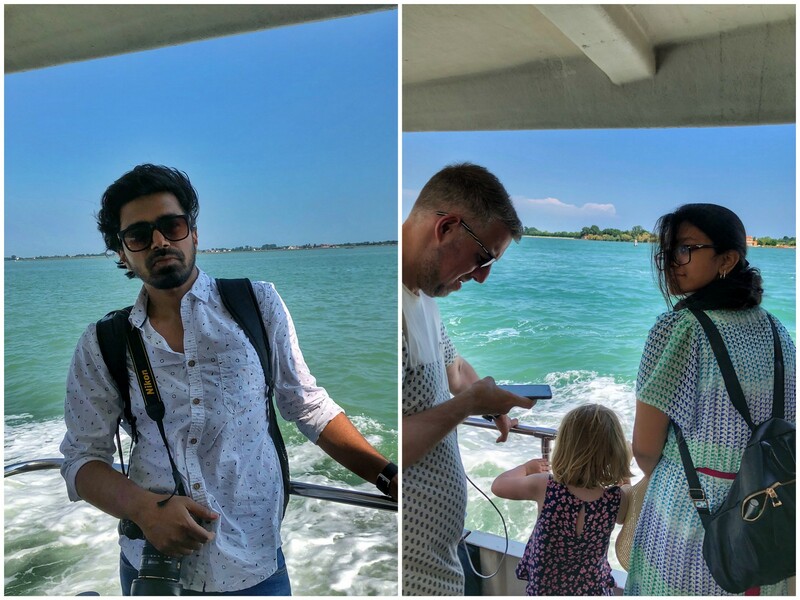 Off we were to Burano Islands, roughly 10-12km from the main Venice island. 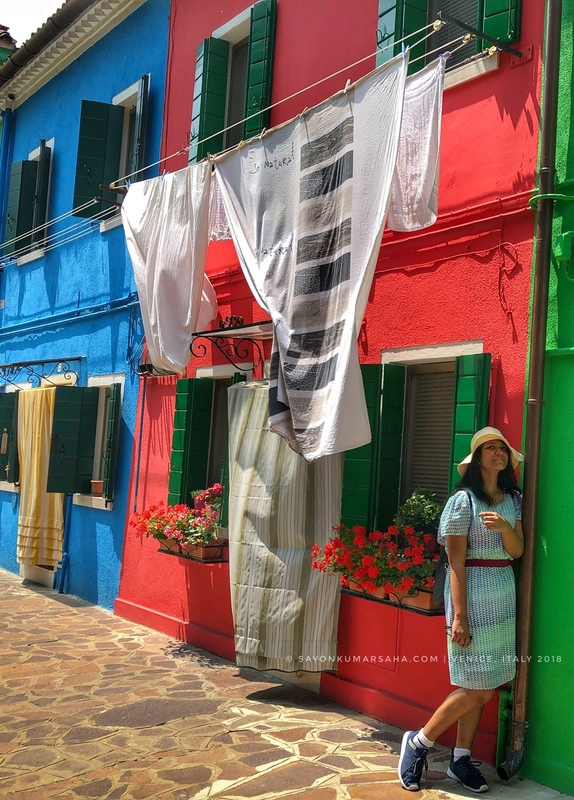 Burano is famous for lace work & rich coloured houses. 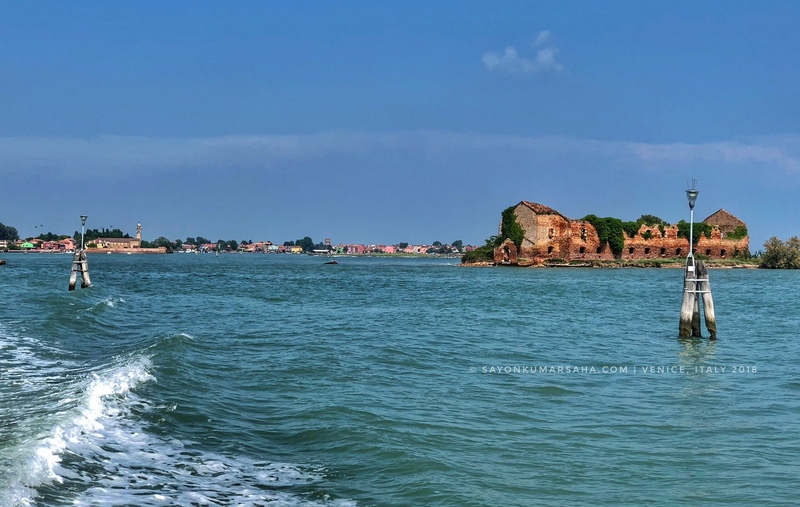 it is the home to bright fishermen-houses & lagoon sea-food eateries! 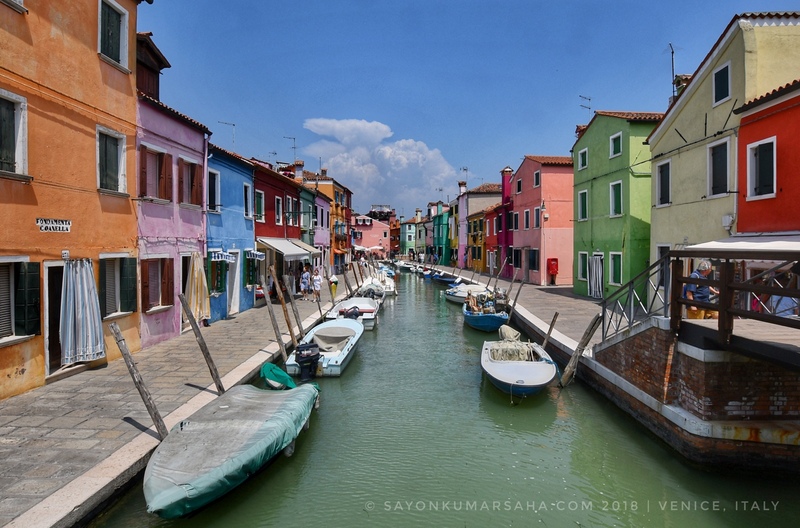 Burano is actually an archipelago of four islands linked together by bridges. 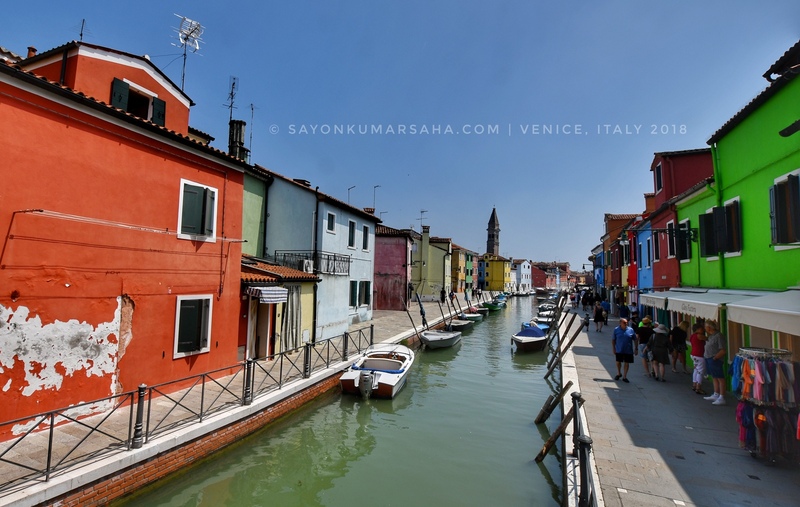 It was intriguing of how Burano is painted with rich colours for each & every house. 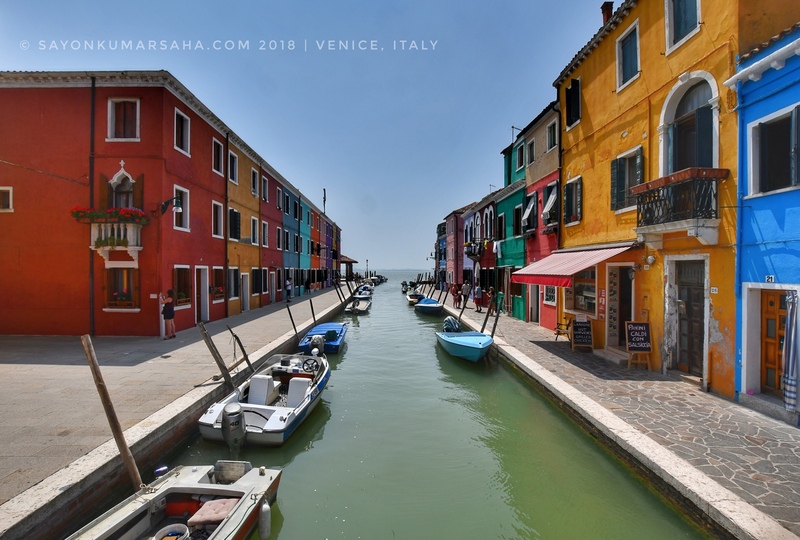 We missed out on the Burano cookie called “Bussolà” & “Esse” which is pretty famous local offering of the isalnd. 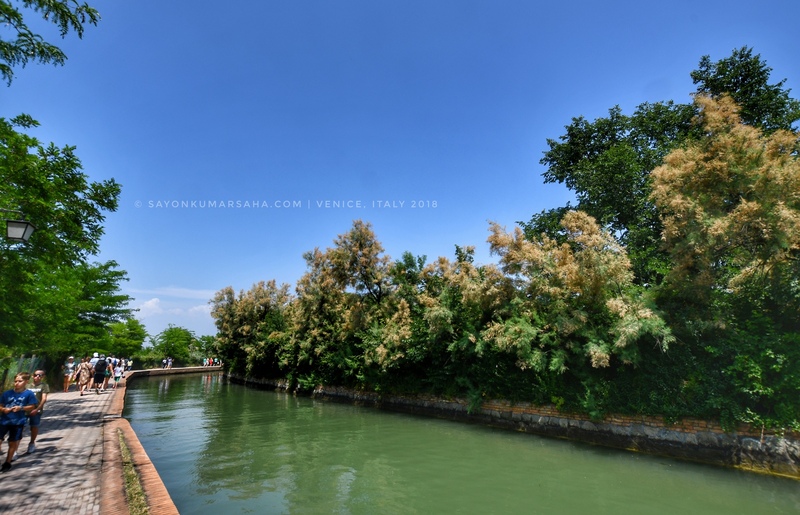 The green water channel adds to the mesmerising hue. Apparently the fishermen painted their houses bright to see them from long distance when they were far away for fishing. 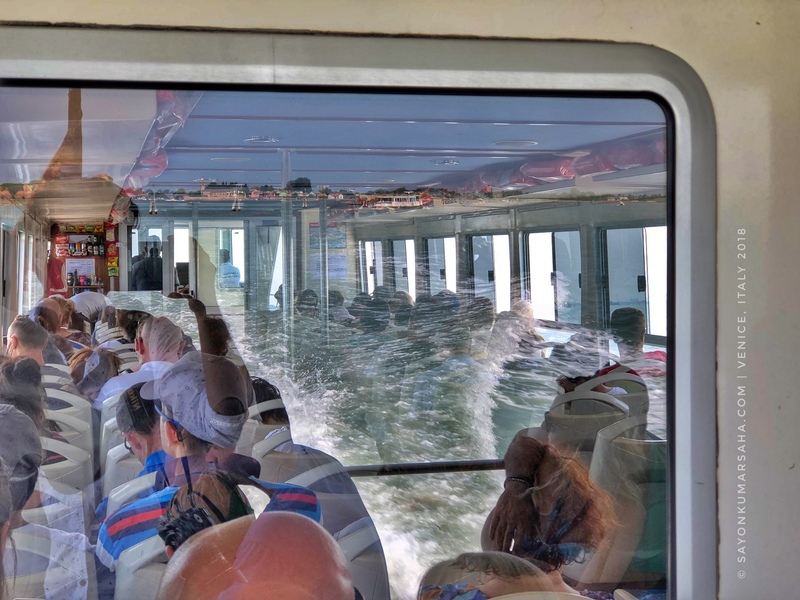 We were at a time when the island was flooded by tourists. But if we visit the more secluded and local parts of the island, the tranquility and calmness of elderly ladies embroider can blow your mind off. It is a paradise. 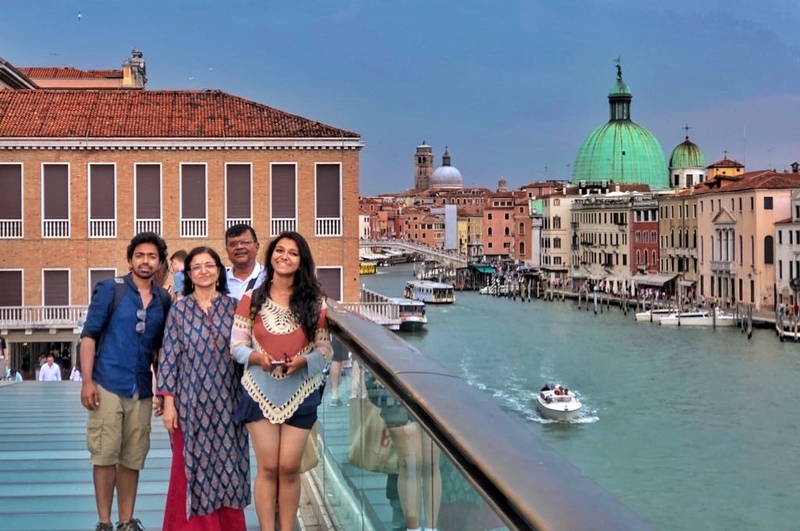 It is rated as one of the most colourful places on earth, ofcourse that makes it picturesque for everyone to strike a pose! 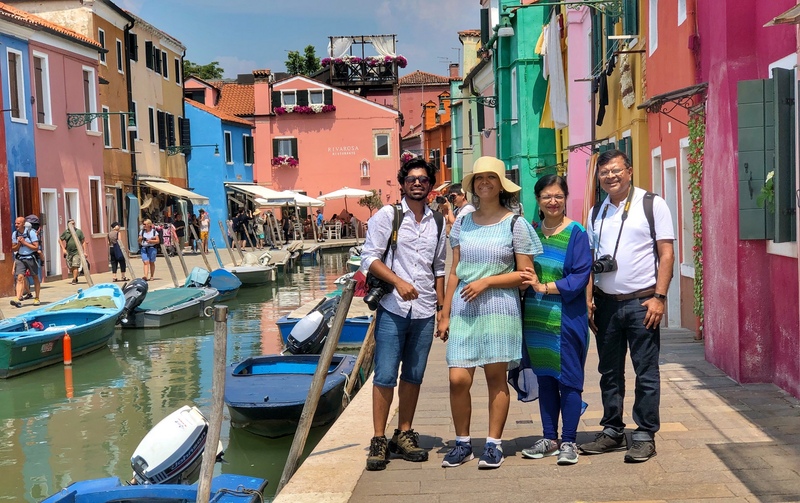 Family picture by the colours of Burano! 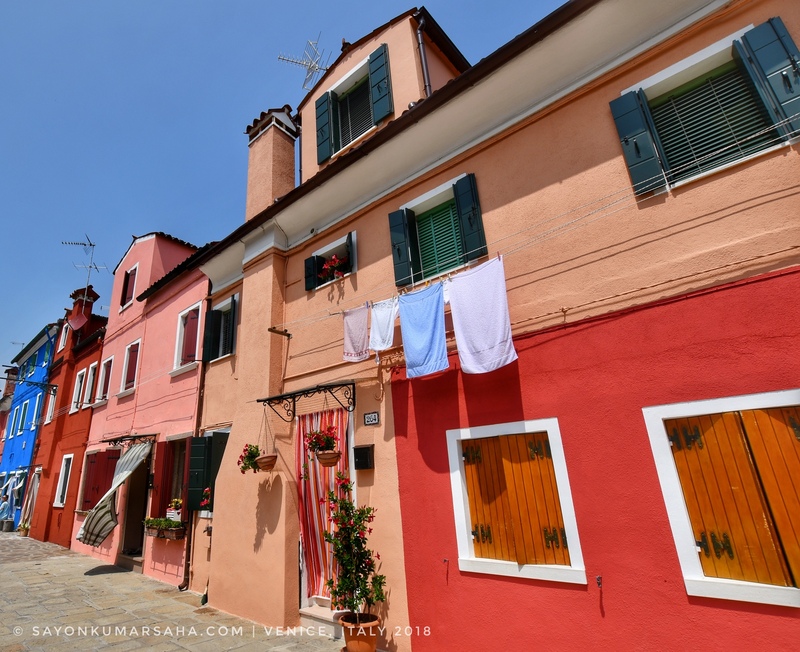 As you can notice, the typical Burano’s houses are similar looking squared-shaped divided into several floors. The history of different colours which are an attraction today goes back to the original usage of delimiting individual properties. 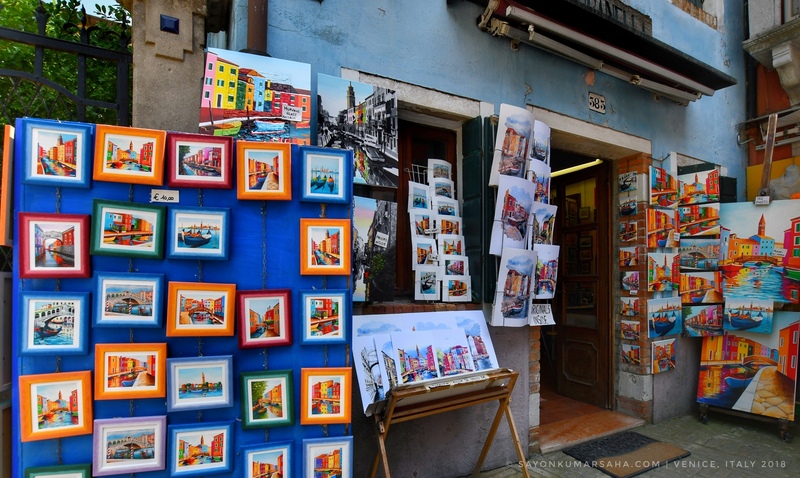 Simple and elegant paintings stood by the colourful alleys of the island. 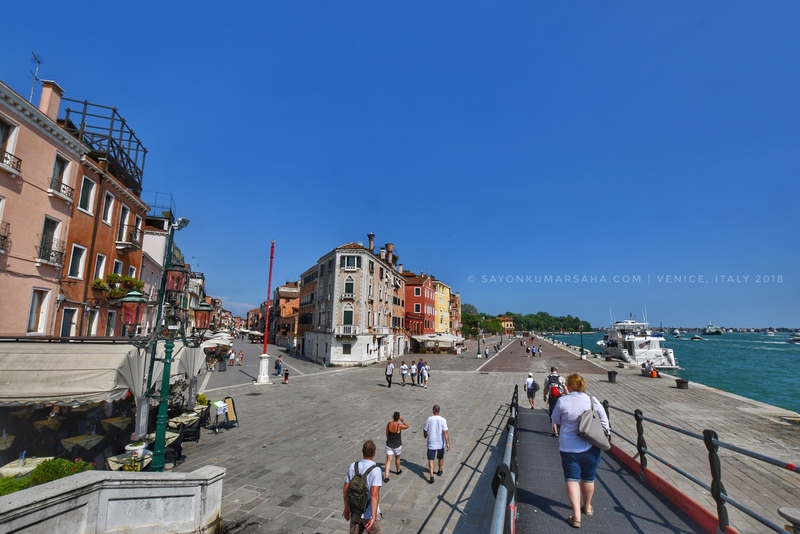 Next stop by the ferry: Lido di Venezia or the Lido Island. As you travel across the ferry, lies a beautiful skyline through Adriatic! Lido is more of a long sandbar than an island. 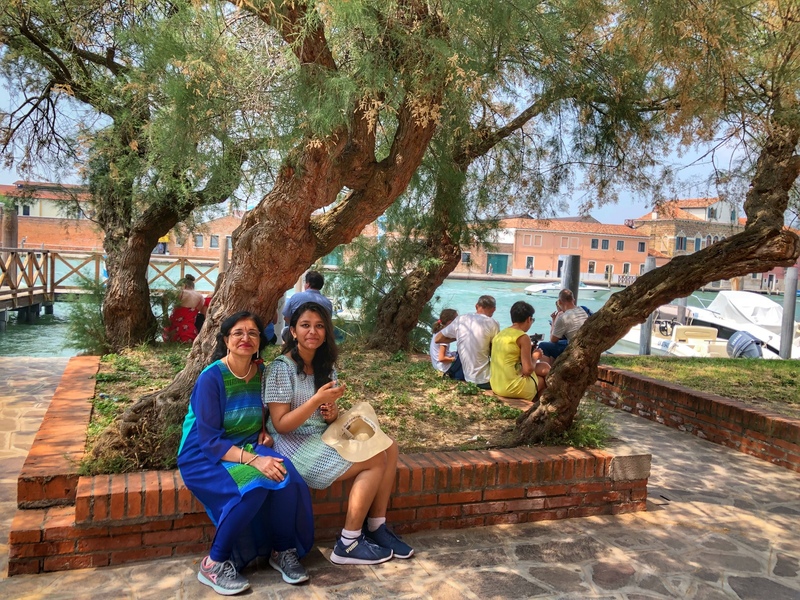 We were already tired in the heat by the time we reached Lido after Murano and Burano. We took a quick stroll and mostly chill by the shacks over some pizzas. If you are short on time, I would personally recommend to skip Lido. 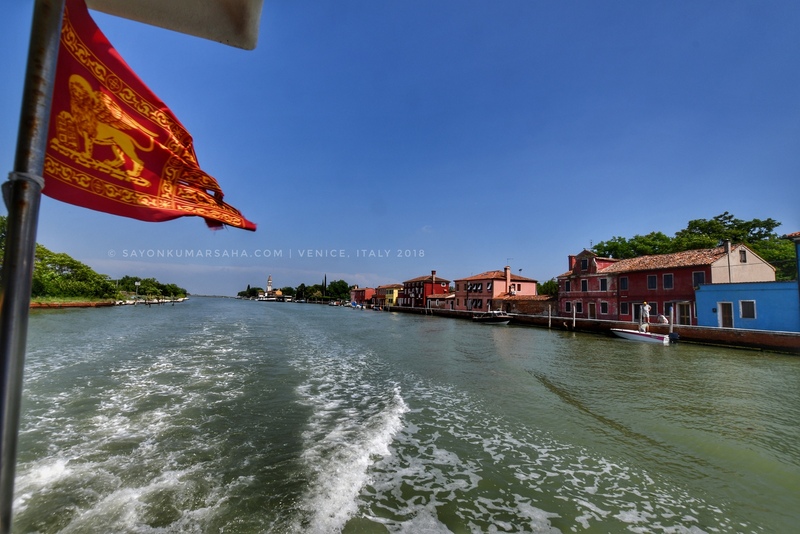 The cruise across the islands of Venice always have a spectacular view of the tiny shores all around! 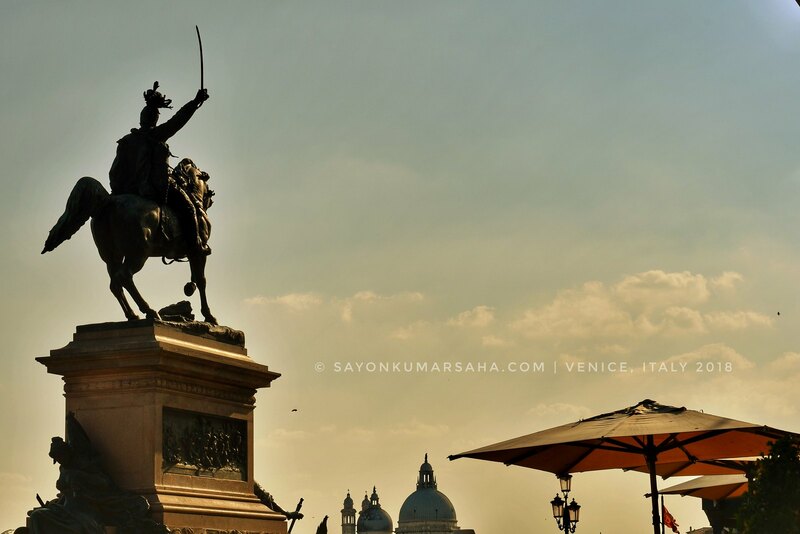 Venice: The City of Love! We were back in the main island by the same harbour. Ofcourse we prefer summer, but this particular day had the Sun scorching at us. 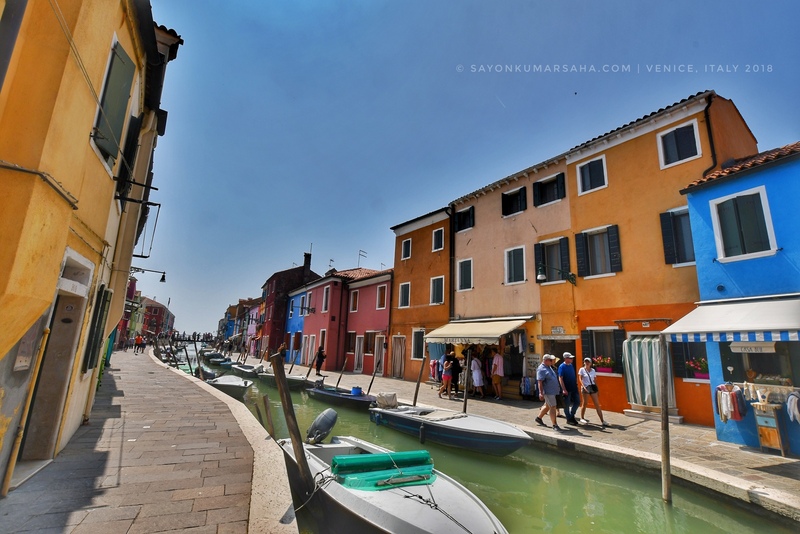 Thus the secluded streets of Venice for a change. The Venice main island had a canal passing by every 10min of our walk. By now we were climbing beautiful bridges every now and then. 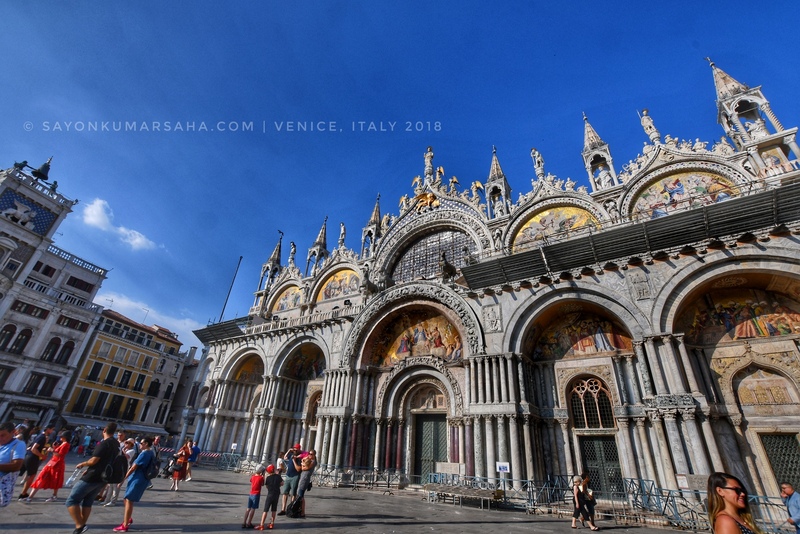 The St Mark’s Basilica church stands all along the Piazza San Marco Square reflecting the glories of Venetian architecture. 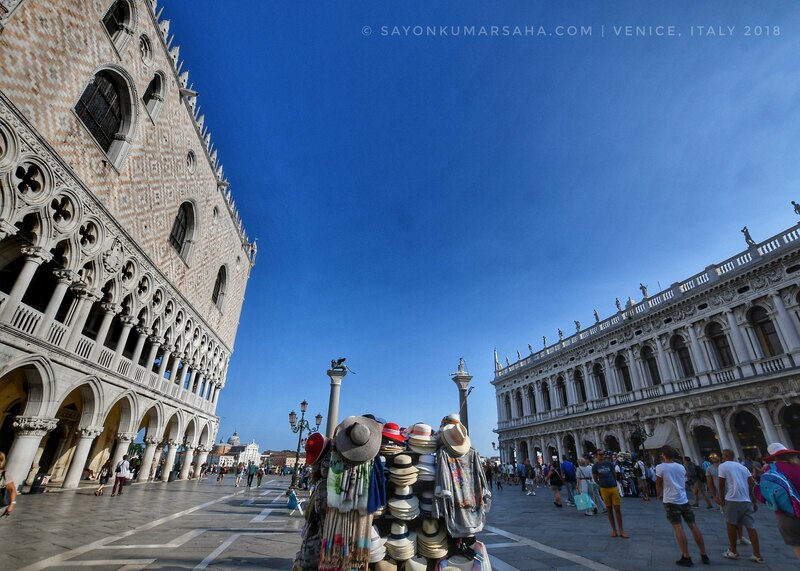 Piazza San Marco or the St Mark’s Square is the most important urban square of Venice. 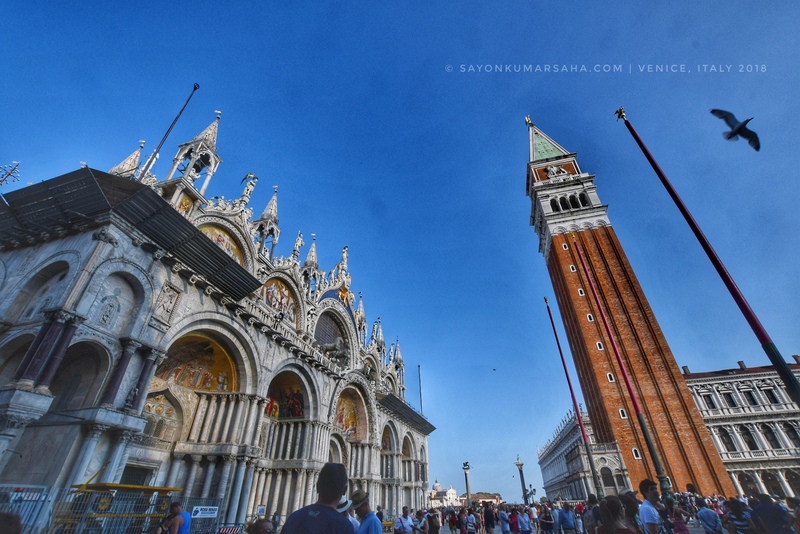 The Campanile stands tall across the Basilica at the Piazza San Marco. St Mark’s Basilica is connected to the famous Doge’s Palace to the right. 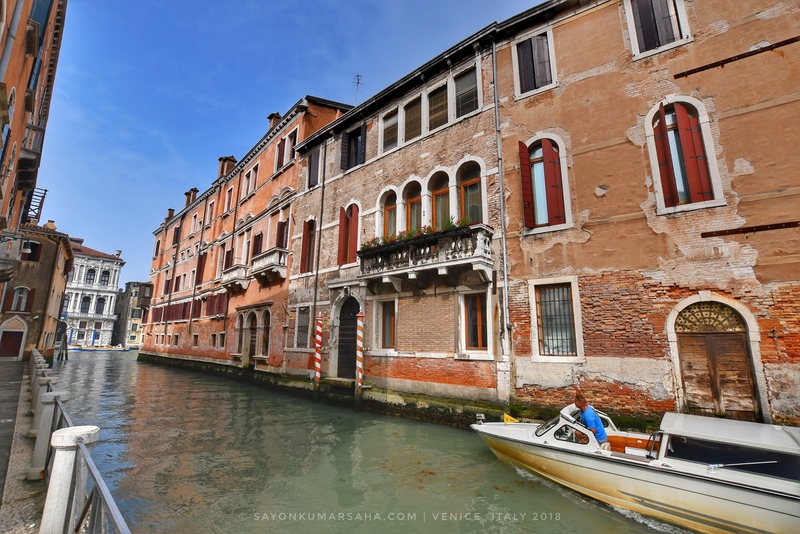 It is the Venetian Gothic palace that was once residence of the Doge (supreme authority) of Venice. Now it is the heart of 11 beautiful museums. 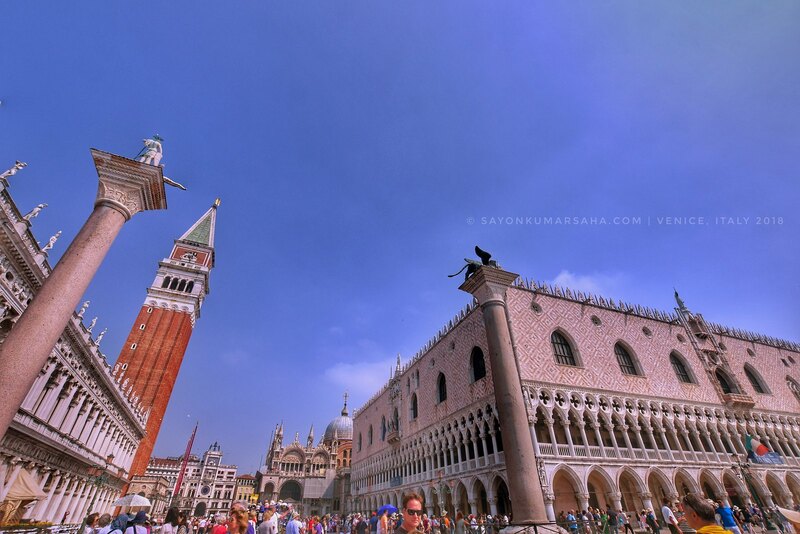 Piazza San Marco or the St Mark’s Square overlooks a huge crowd of tourists very single day! 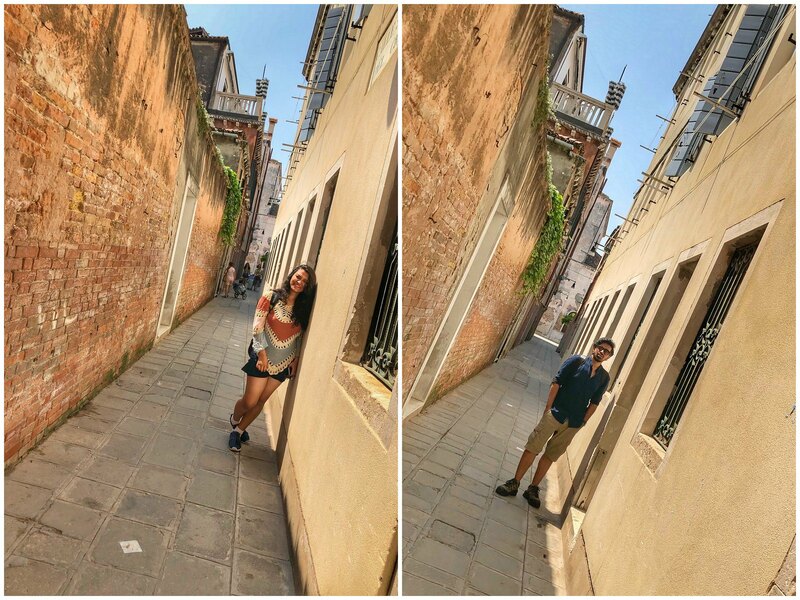 The next morning we were exploring the alleys of Venice main island. Narrow alleys here simply gives up on GPS and always led to a canal sooner or later. A planned navigation isn’t a good idea here for sure! The alleys of Venice at some point no wonder got us nostalgic with the vintage North Calcutta streets from our hometown. 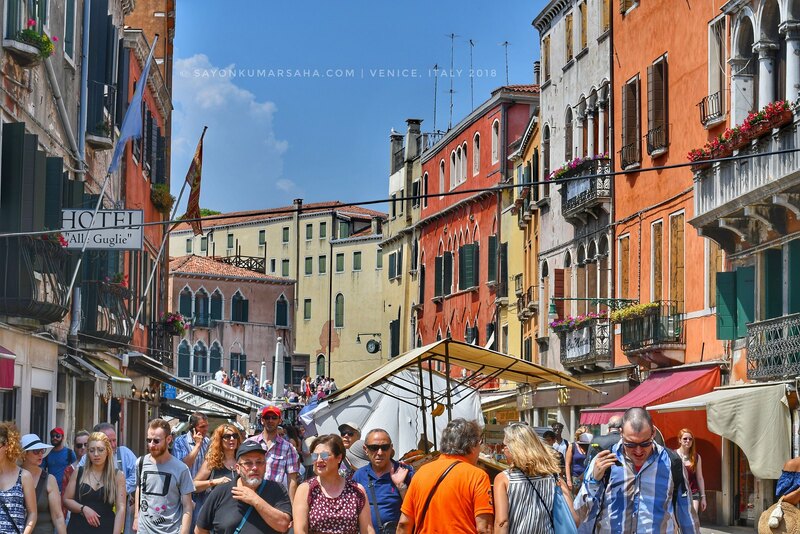 Packed with tourists, thats how the main alleys of Venice look like on a Saturday morning! 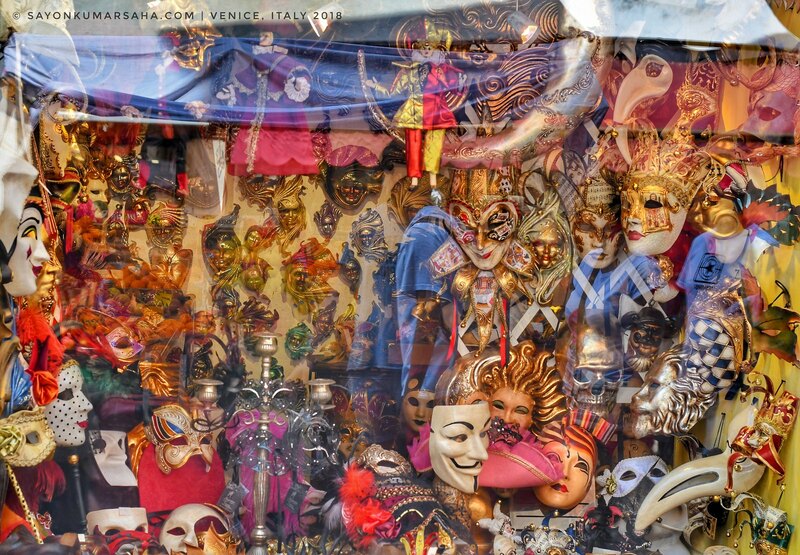 Venice is also known as the “City of Masks”! The distinctive masks are the major features of the Venetian carnival tradition! Given the variety and the colours, these masks turned out definitely to be an unique souvenir for us tourists! Food was something I always looked forward to in Italy and Venice was no different. One always had innumerable eatery options throughout. The street food of Venice especially can make you go overboard. The alleys are always line up with varieties of local fresh food! 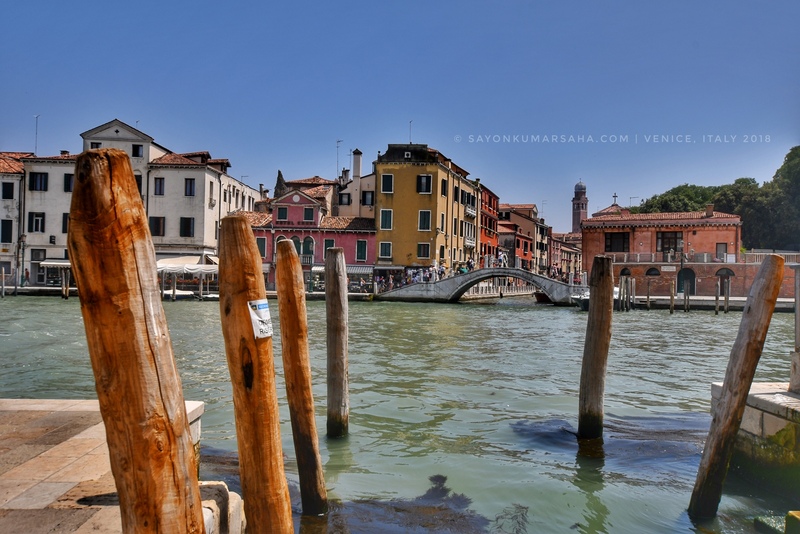 Also the lagoon aquaculture yields seafood in Venetian cuisine that is rare. 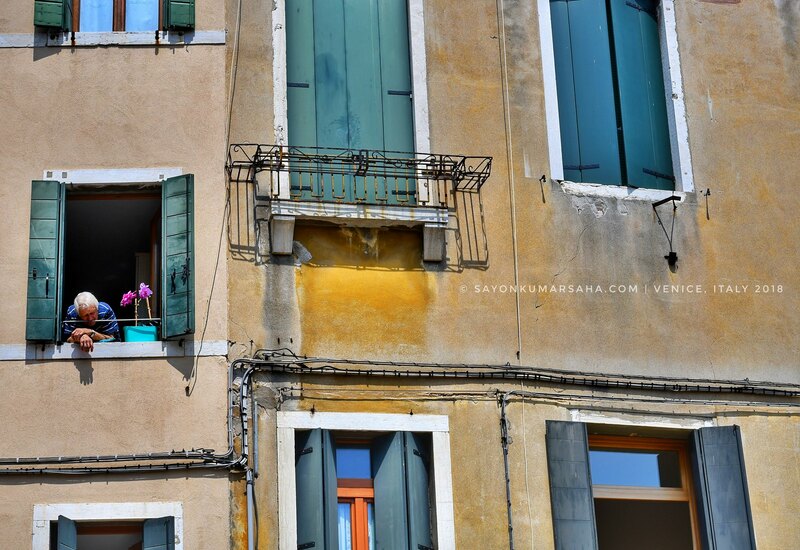 Venice has its history tracing back to the ancient spice routes by the canals! 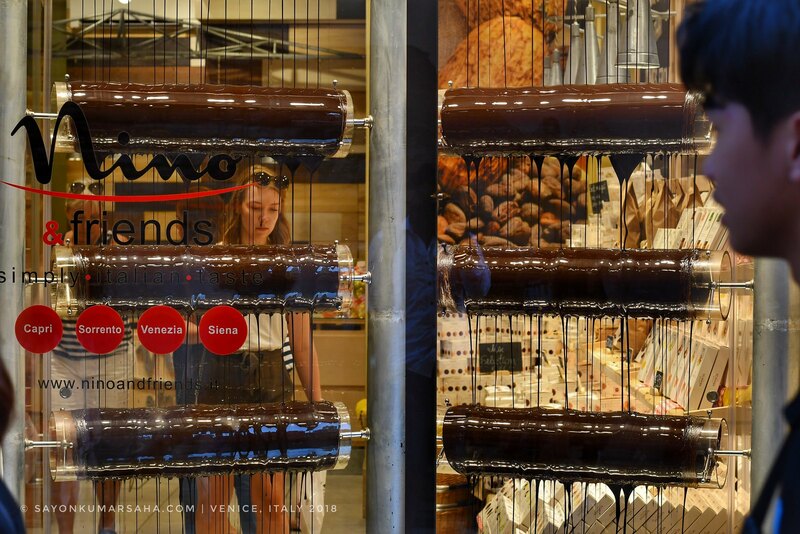 Chocolate fountains across the narrow alleys and canals are an unique experience. 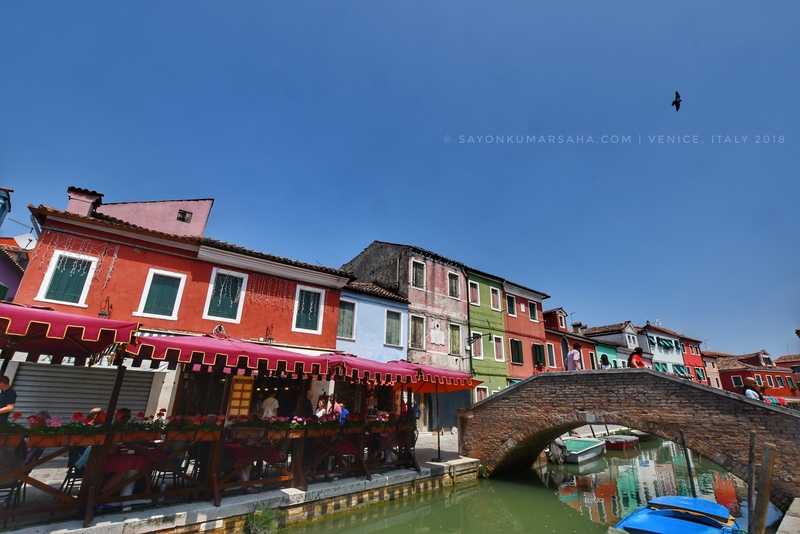 This floating city is well-known for its food culture and amazing wine bistros at every corner of the streets! Too bad we didn’t have the chance to experience sunset in this city of bridges and canals! 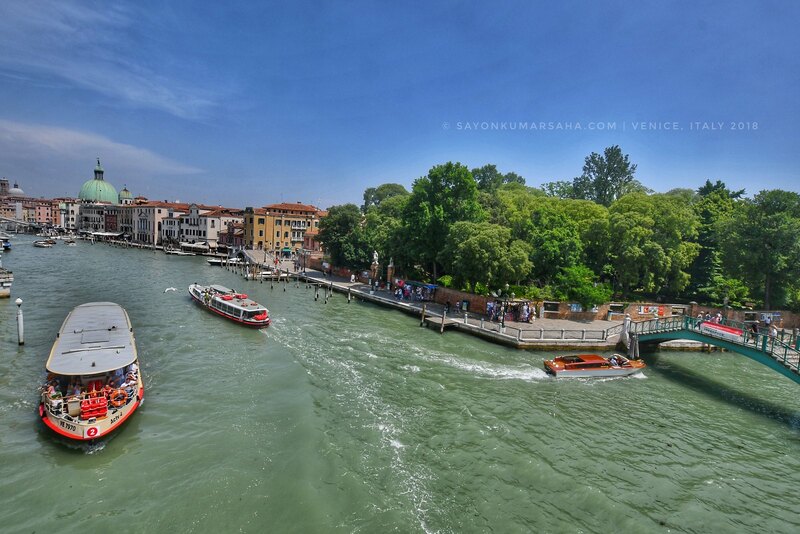 Boats lines up across the shores of Venice, an exquisite city that seems miraculously built on water. 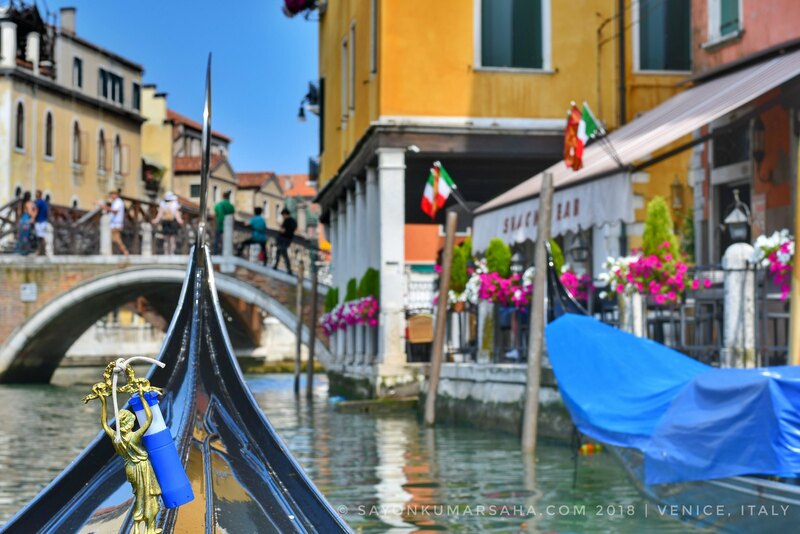 It was already time we needed to hop into the famous Gondola! 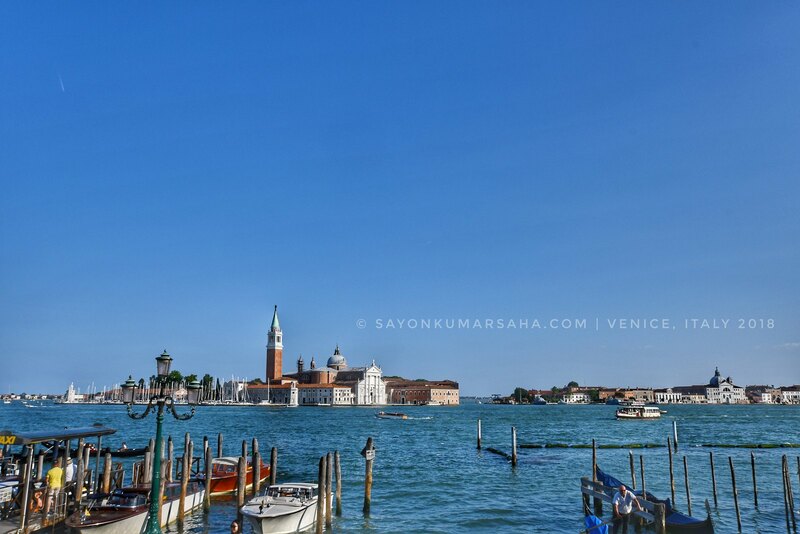 What more could be the iconic symbol of this romantic city! 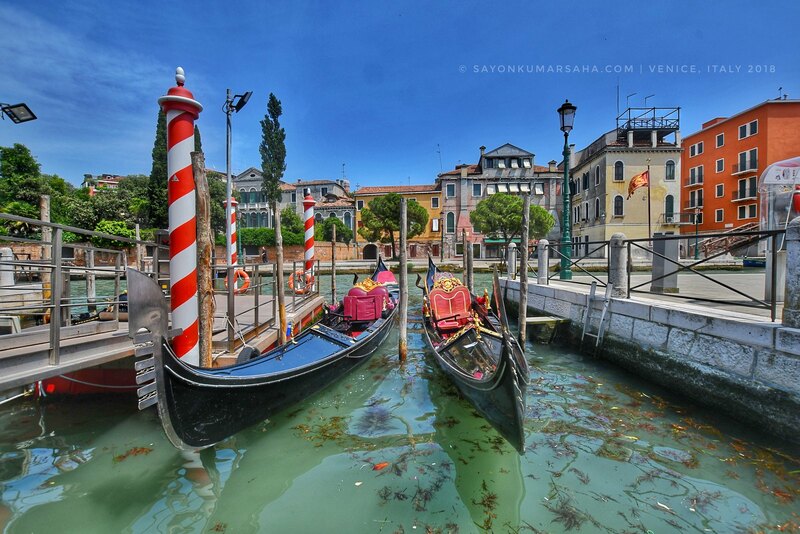 A Venetian Gondola ride across the canal is worth the experience, taking you back in time. These rowing boats specially suited for lagoons were once used by the upper class locals when they were 10,000 in number. 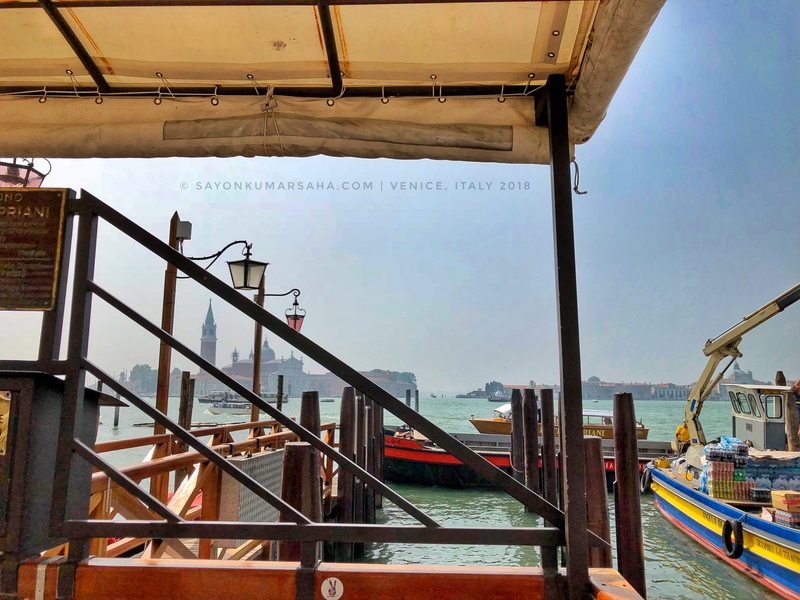 Now there are only 500 gondolas going around mostly for tourists! 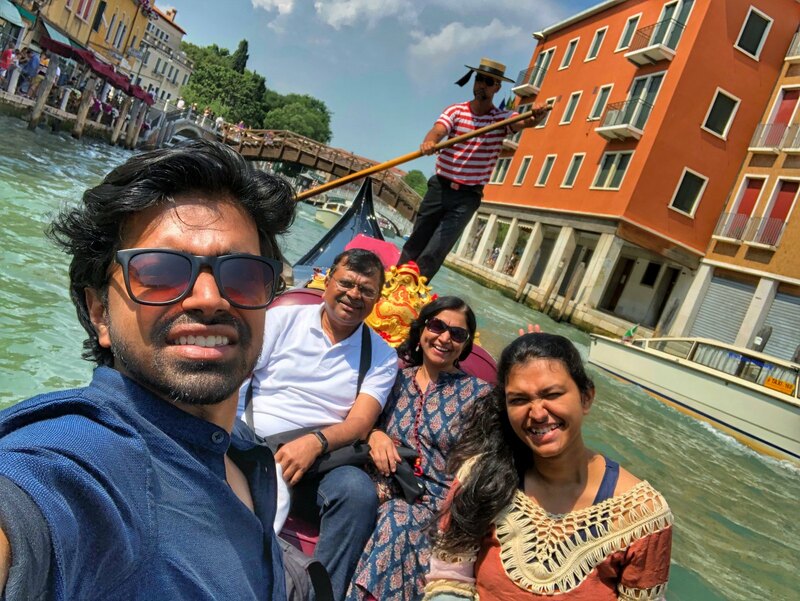 And there is a super-happy family selfie during the gondola ride! 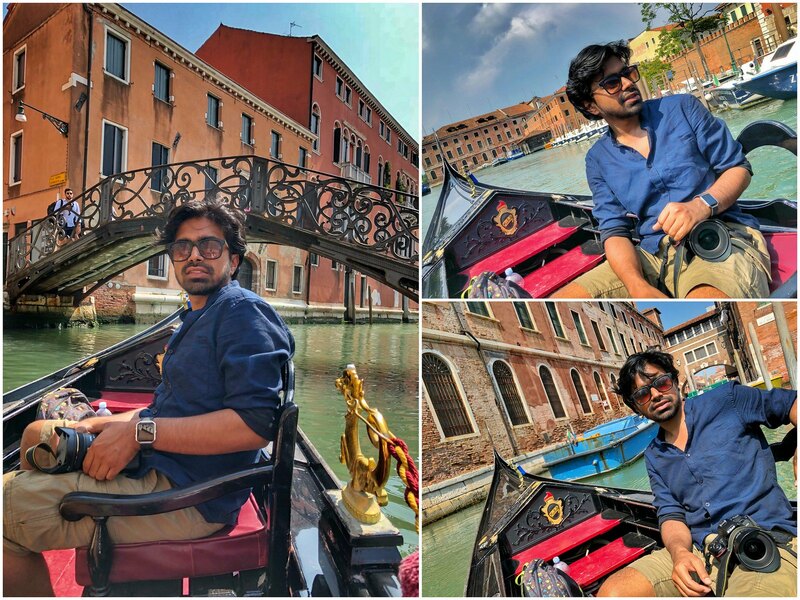 These gondolas reminded us of the ones we have in Dal Lake and Gulmarg back in India, something that I wish to experience soon. 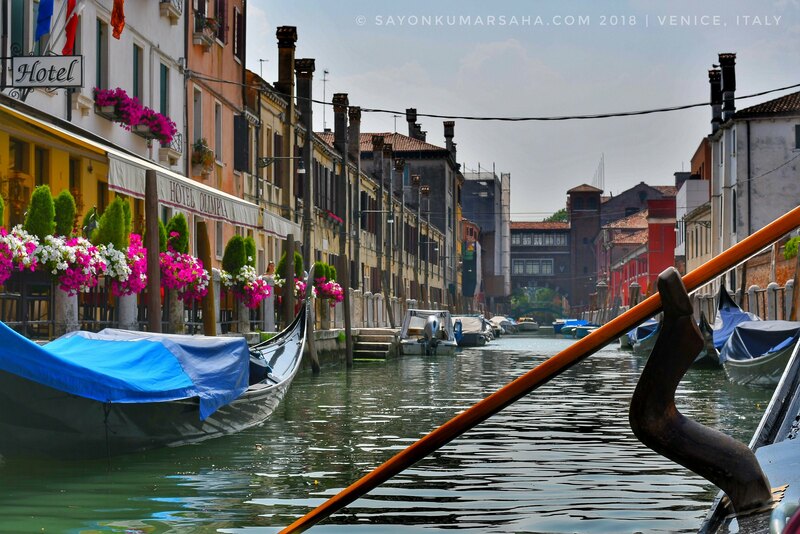 The half-an-hour Gondola ride took us through some really beautiful narrow canals across the island. It was interesting to go under the same bridges we were walking over the other day. 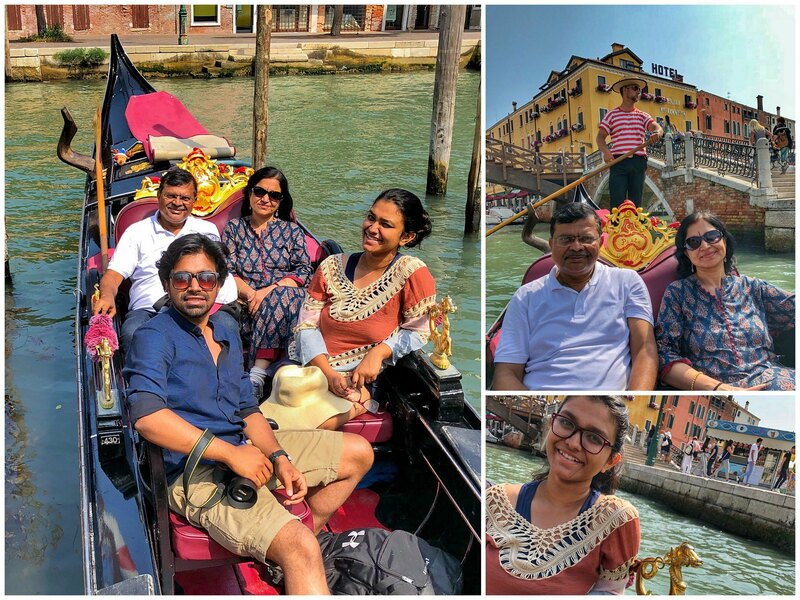 Gondola rides are beautiful in Venice with your loved ones! 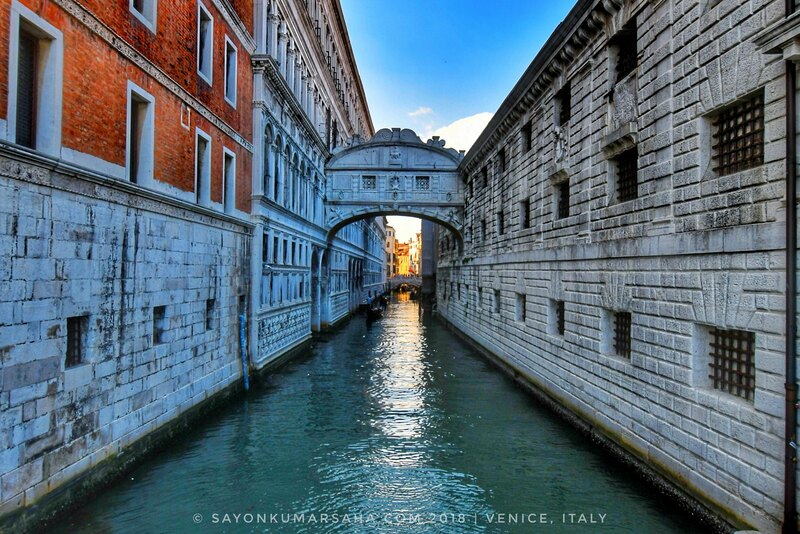 Ponte dei Sospiri or simply the Bridge of Sighs is most famous white limestone bridge of Venice. 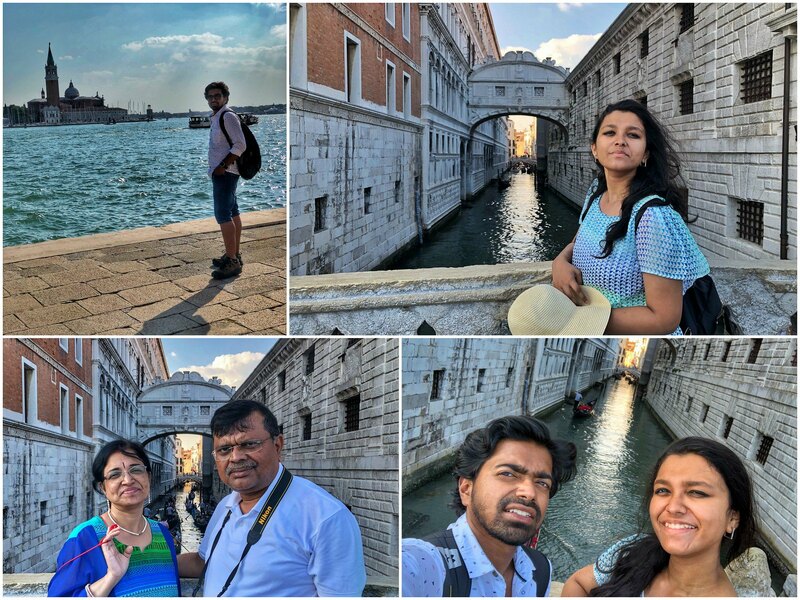 This arch bridge crossing Rio di Palazzo is extremely beautiful given that it is not blacked out by tourists on a sunny summer afternoon! 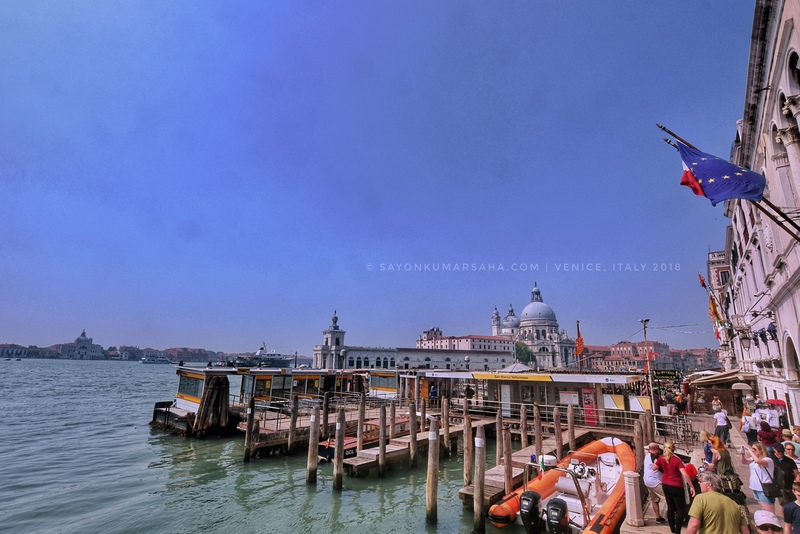 Right when you go out of the train station, stands the beautiful basilica of San Simeone Piccolo across grand canal! 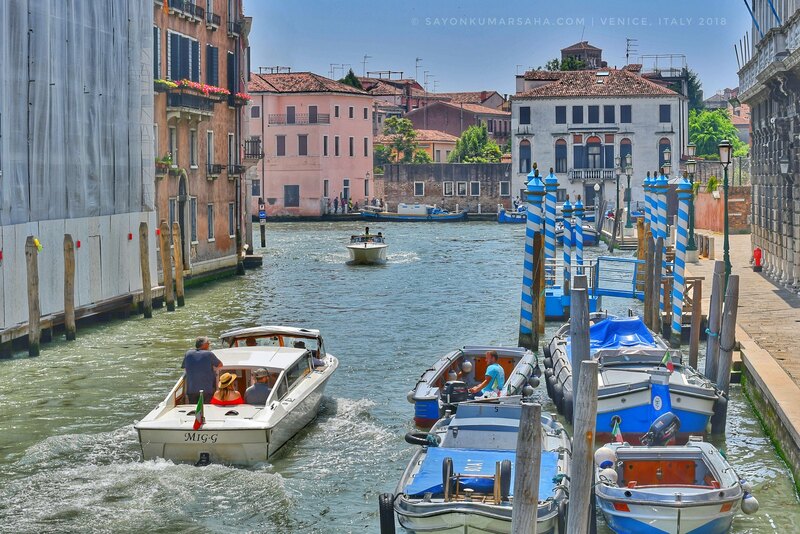 It is the heart of water-taxis and water-buses connecting Venice throughout. 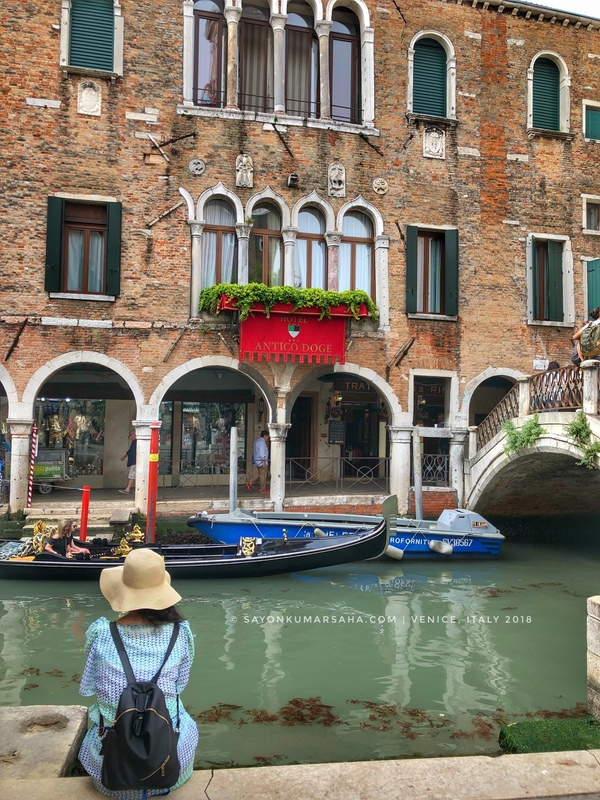 TheGrand Canal of Venice is the largest of the innumerable Veneto canals with glorious architecture lined up across its bank.